This beautiful, luxurious holiday home is near Maredsous in the Vallée de la Molignée. The attractive, completely renovated farmhouse is on a large country estate surrounded by nature and in an oasis of tranquillity. After a walk through the woods on the edge of the grounds, you'll come home to a lovely, cosy living room with comfortable sofas. There's a luxurious kitchen with a large dining table. The living room borders on a spacious patio and there's a large garden behind the house. If bad weather, you can still enjoy yourself in the cinema room, the spacious dining room and the living area. 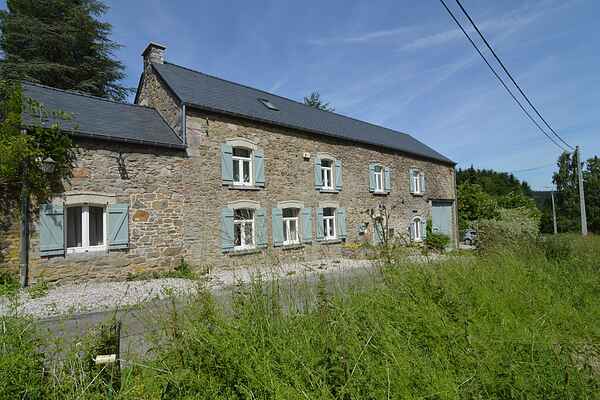 The holiday home is a 10-minute walk from Maredsous Abbey and Maredret Abbey. The centre is 2 kilometres away and there's a restaurant 1 kilometre from the house. The area offers several walking trails including the 'Ravel' (old railway, only accessible for walkers and cyclists). Other destinations for great day trips include the Montaigle Castle ruins, the Château d'Annevoie with its beautiful gardens and the Citadel of Dinant.